The Visiting Privilege by Joy Williams, reviewed. The collected stories of Joy Williams. 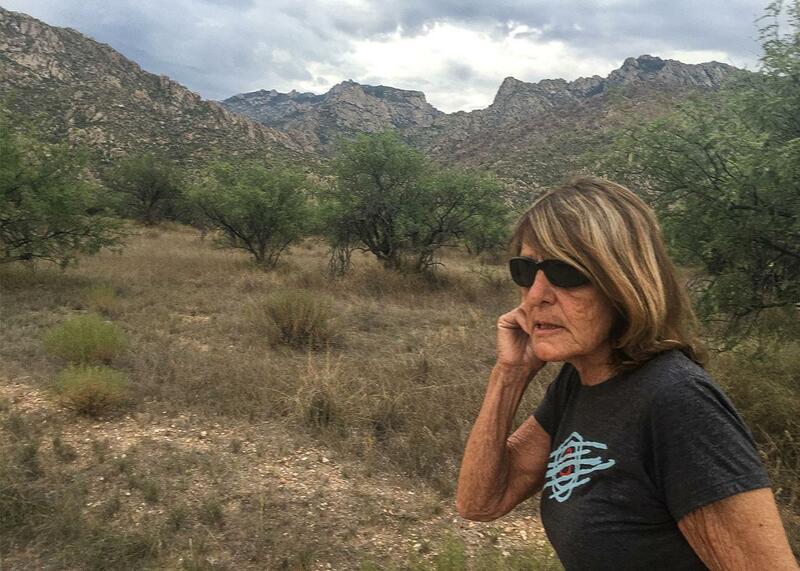 Joy Williams, Catalina State Park, Arizona, Aug. 7, 2015. I believed stories should have a purity and not be about what was going on—and there was a lot going on, of course, in my life. My husband and I acquired a toucan, then we had a baby. No one knew I was going to have a baby. I was skinny, no one seemed to remark. You know, I didn’t even tell my parents, my dear, dear, supportive, loving parents. When my husband called them on April 6, the day Caitlin was born, they didn’t believe him. Why did I do that? I don’t know. It was so cruel. I suppose I was a little odd, a little secretive. I still have secrets. In real life, in the long view—a phrase that appears often in both the fiction and the nonfiction of Joan Didion, usually with vicious dismissiveness—Joy Williams would leave that husband just two years later for another man, Rust Hills, who was, at the time—as it happened, to use another Didionism—also married. Baby Caitlin would take his name, although Williams wouldn’t. That’s just life, a lot going on, and life’s always a crap story. The Visiting Privilege assembles stories from as long ago as 1966 and as recently as this summer. In one of the recent stories, Williams wrote, on one of her many typewriters: “Alligators shared their water-hole homes with all manner of creatures, until they didn’t.” She means the crashing shut of jaws, the instant cloud of feathers or scales where there was only stillness. Situations are notable beginning from the moment they become no longer true. Another thing she typed: “When his father retired he had lived in a condominium building in Miami called Ambience—they’d had a laugh or two about that—and then he’d had a stroke and died in a nursing home, an innocent, which did not keep him from dying in terrible fear.” This is all about the twinkling of the change. When will you, and how? And in the meanwhile—is this the short view?—what does a writer do as the years pile up? It is not for all of us to luridly document the blow-by-blow of the hard facts around us. “Still, it’s dangerous work, as every part of the grieving process is if it’s done correctly,” says a daughter about her mother in one story, who is, after the death of her husband, building an enclosure for an endangered tortoise. Fair. We live in a time gone lousy with public interrogation of the self, and yet whatever became of that toucan? The baby, her you can Google. This is a decades-long stack of stories about people whose balance may never again tippy-toe on the ocean floor. By how much do we miss? Just enough, for here someone is always dying or is being died at. A big book of aphorisms without morals, these are stories populated by a huge number of attractive dogs who do not fulfill their owners’ happiness, by a truckbed’s worth of murdered cats. Certainly there are very many children who unnerve their fickle surprised minders, and double that number of parents who are not able to perform their parenting well. Here a young man and his fiction-editing boss sweep with panache through funeral after funeral; there, in the next story, a woman’s car runs over a slew of headstones and she awaits in jail the vengeance of the living. In the very next story, a man finds his calling, and an assistant to boot, in the handling of dead and dying animals on the roadsides of a summer island. Then he dies. “That summer was the hottest anyone could remember. The flowers browned against the white fences, the berries withered before they were blue. At the ends of the roads, there were dark mirages and the boats seemed to ride on glass.” Each time I’ve gone into the ocean this season, I’ve thought: I’m inside a giant rock tumbler of bodies being stripped to the bone. God was watching us all with equal passion. When I was young I loved Joy Williams because I thought she was just so hilarious. When I got older I loved her because she refused to look away. In turn, I refused to read the very last story in this collection. It was as if to finish the book would be some final departure, some cruelty. It was dark and I did put down the book and then I watched a stray black cat across the street eat without caution from a plate we’d put out for him between two parked cars. Over the centuries many have wondered anxiously or with excitement if a piece of writing exists that can make the reader insane. An accidental glimpse of just a page too many and it’s the last push! Then you will wander forever senseless in the sunny oblivion of our strip malls and killing animal shelters and freeway on-ramps, or, hey, are those off-ramps? All these animals were too troublesome, too unrewarding, and so even here on dry land you live, in the long view, shoulder-deep in a landfill of animals suffocating. That’s between you and God. To reconsider, “the baby would take his name; she wouldn’t,” there’s not a thing wrong with a beautiful story like that. In the specific case of Joy Williams, the fiction-editing second husband would stick for decades, until he died at the age of 83 in 2008. Christopher Buckley once narrated his end in our world: “In the company of his wife and daughter and grandson and son-in-law, Rust had a glass of scotch, a bowl of clam chowder, a slice of blueberry pie, and died.” Great story. A lot going on. No memoirs followed. The Visiting Privilege: New and Collected Stories by Joy Williams. Knopf.